Batman Ugly Christmas Sweater: Christmas Knight | Nerd Much? Our love of the holiday season might be on another level here at Nerd Much. There are so many fandoms ripe for holiday merchandise, and we can’t help but get excited when we see another Yoda Christmas ornament to hang on our tree. Of course, superheroes get a lot of love around the holidays, and soon, you’ll be able to wear your own Batman Ugly Christmas Sweater thanks to Merchoid. The rather stylish knitted sweater, of course, has a Christmas theme, with snowflakes, poinsettias and an overall Christmasy aesthetic. On the bottom is the Gotham city skyline, as well as a Batmobile. Knit front and center of it is a Batman logo — unfortunately, not the black and yellow one from 1989’s Batman (which, coincidentally, we rewatch every holiday season). Instead, it’s the newer version seen in Batman v Superman and the one that will be seen in the upcoming standalone Batman movie. Still, it’s a fantastic-looking, high-quality sweater that friends and family will love. We’ll be adding it to our list of the best ugly Christmas sweaters for nerds in 2016 soon, but for now, head over to Merchoid to check it out. 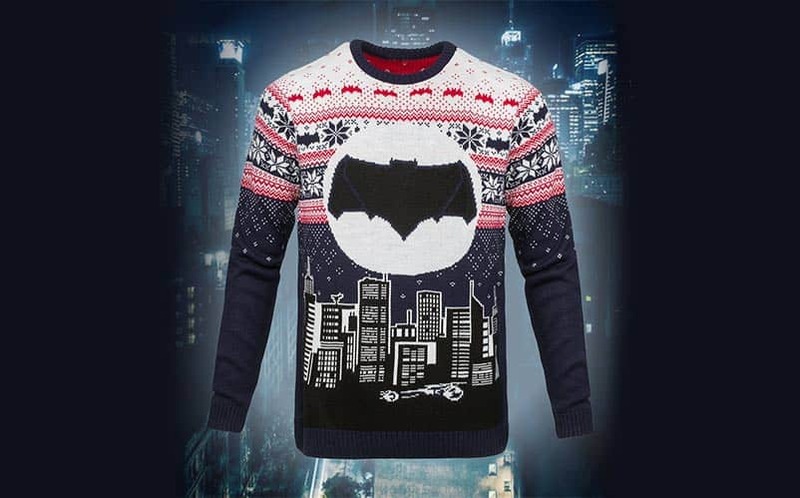 Buy the Batman Ugly Christmas Sweater here. For more cool nerdy Christmas stuff, stay tuned to Nerdmuch.com for fun finds. Every day, we post two or three cool nerdy things that blip on our radar. You can also follow us on Twitter for timely updates.